Newberg wrestling won again. Ho-hum. The performance was far from ordinary, though, as the Tigers wrestled well enough individually at the Reser's Tournament of Champions to earn a first-place finish in team points. The tournament – held at Liberty High in Hillsboro on Jan. 25-26 – draws the best of the best from around the state to compete for individual glory. Newberg had just one winner in an individual weight class, freshman Charlie Evans, who was the No. 6 seed at 132 pounds. 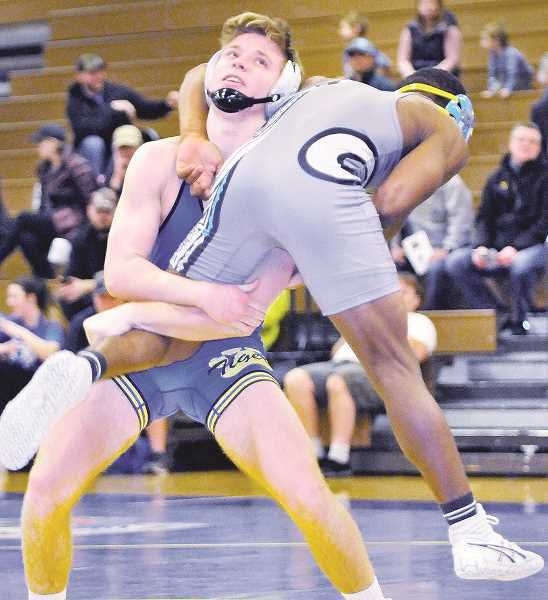 In total, the Tigers had seven wrestlers in the semifinals and four in the finals, amassing 214 team points to beat second-place Crescent Valley (5A) by nearly 40. "Our kids were pretty impressive," Newberg coach Neil Russo said. "They just continue to impress me every week. They wrestle hard, they compete hard, they're listening and they're making changes. That's all you can ask for." Freshman Ayden Garver lost in the finals at 113 to a former youth wrestling cohort in Crescent Valley's Chance Lamer. The match was 19-4, but Russo said it was much more competitive than the score might indicate. Senior Christopher Strange made a dominant run to the final match at 120, but lost a 10-2 major decision to Lorenzo Vasquez from Culver (2A). Vasquez is likely headed for a fourth consecutive state title at the 2A level and the Bulldogs are one of the more formidable wrestling teams in the state, regardless of classification. Junior Hunter James lost in the 195 finals to No. 1 seed Santos Cantu in a 12-5 decision. Cantu beat James in the state finals last season, so there was some history between those two wrestlers. Newberg's depth allowed it to pull off the team victory in the tournament and continue to prove itself as one of the best wrestling teams in the state. Russo's team is entering the home stretch with a state championship in mind and it's continuing to prove that it will have a significant chance. "It was a total team effort for sure and that's what it takes to win a tournament like that," Russo said. "You can't win it with four or five guys, even if all five of them win it. You need depth and people scoring points." Every Newberg wrestler that Russo entered in the tournament scored team points for the Tigers. That is indicative of their ability to wear teams down in dual meets, but also win individually. Before the Reser's tournament the Tigers defeated Century 61-15 in a dual meet on Jan. 24. The tournament was a true display of Newberg's talent on the mat, however. "We got a lot of bonus points and a lot of falls, and that was really the difference in the tournament," Russo said. "We had nine kids place and every kid score. When you can do things like that and you have kids that understand how to contribute and compete, you turn an individual sport into a team sport." Newberg has this week off, resting and recovering from injuries and illness as finals are underway. Their final dual meet of the season is on the road at Liberty on Feb. 7 before the Tigers head to the Pacific Conference district tournament on Feb. 15-16 in Forest Grove. "It couldn't come at a better time," Russo said of the bye week. "We've got some kids who are sick, I'm sick, and so it will be nice to have a week off to catch our breath and get back in a groove."